Sarah and Christopher first encountered each other on a charismatic retreat at Franciscan University, where they both were students at the time. For two years after that, they were best friends, spending hours watching movies, going to Mass and praise concerts together, and having breakfasts with friends. From the Bride: Fast forward to the spring of 2012, after a couple starts and stops of not wanting to ‘ruin’ our friendship, Chris asked me to be his girlfriend after the 7:00 AM daily Mass at one of our favorite spots. We should pause our story here to note that this Mass was the end of a 12+ hour third date that included a trip to the ER. We knew from then on that we were in this for the duration. We each moved back to our respective hometowns after graduation a month later. After two years of dating long distance, traversing between Dallas and Dunedin for weekend visits, Chris moved to Florida. Ten months passed, we added Bosco the husky to the mix, and Chris proposed. Back on that retreat where they first met, Chris had given Sarah her first brown scapular, a sacramental given to St. Simon Stock, a Carmelite priest, by Our Lady. He proposed on the Feast of Mount Carmel. 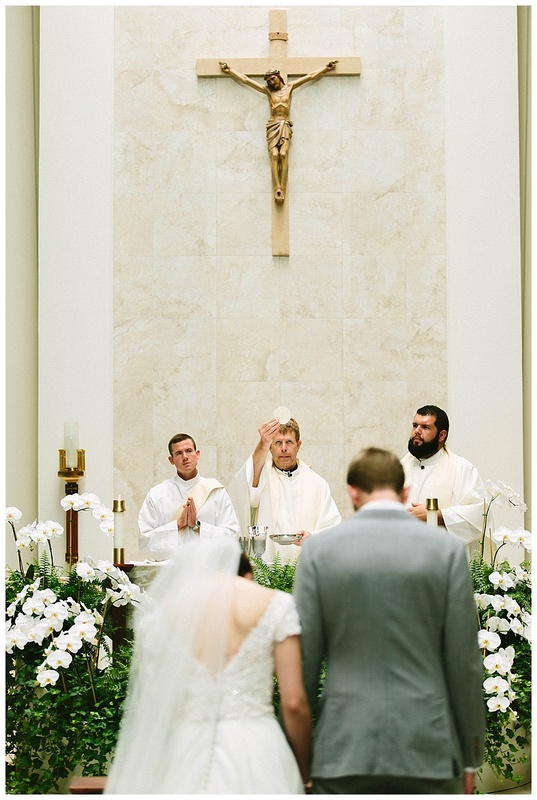 From the Photographer: For Chris and Sarah, the Mass was the most important part of their day. Our Lady of Lourdes in Dunedin, FL, where the ceremony was held, is Sarah's home parish where she currently serves as the Director of Faith Formation. It is a more modern church with a lot of natural light, which added to the airy feel of the entire day. 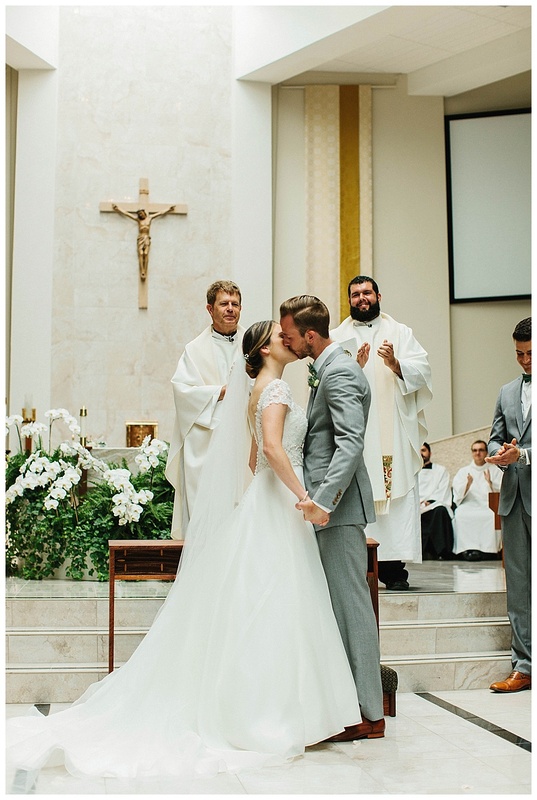 The two priests who presided at the wedding are close with both the bride and groom. Sarah and Fr. Chuck became friends on a retreat a few years back, and he actually made the kneeler that Christopher and Sarah used during the Mass as a wedding gift. Fr. Chuck also delivered a touching and personal homily and presided over the vows. Fr. 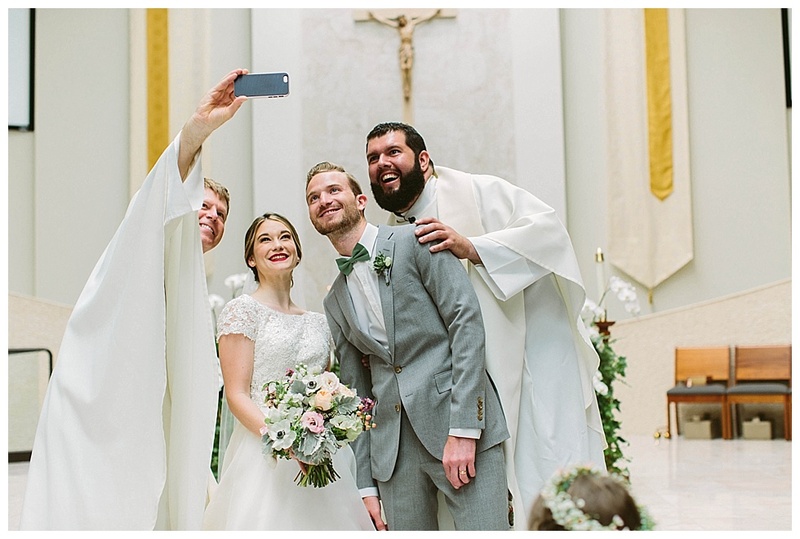 Gary, who serves as the pastor at Our Lady of Lourdes has a tradition of taking a selfie with his couples...and Sarah and Chris were no exception! Sarah and Christopher are both from close-knit families with five children each. All of their siblings were included in the wedding party. Sarah and her sisters are particularly close, sharing matching tattoos even! 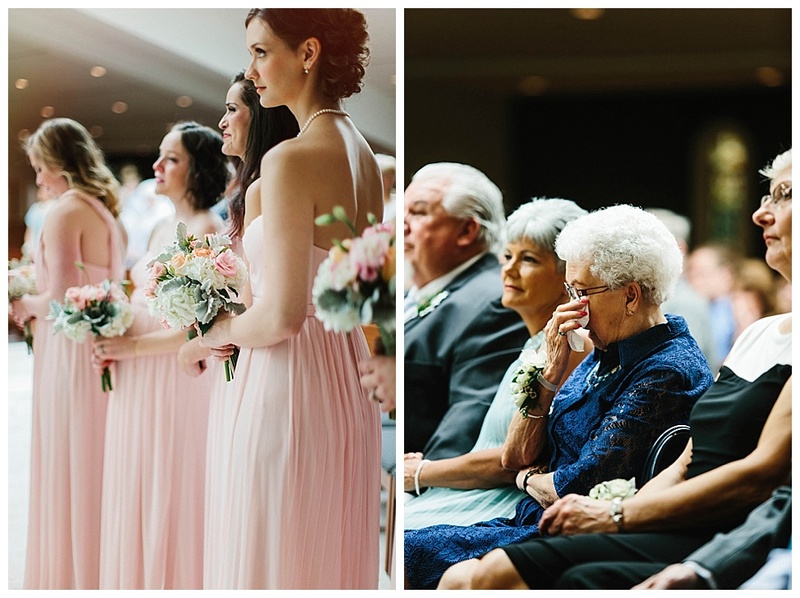 Both of her sisters were honored as the Maid and Matron of Honor. Sarah also wore her older sister Mandy's pearl earrings. Sarah has a love for bright colors and the Kate Spade brand. Her natural choice for a wedding day scent was Kate Spade's Live Colorfully, and she also wore sequined Kate Spade Keds that Chris gave her as a gift. She donned her signature bright red lipstick, which made her beautiful blue eyes pop against her fair skin. This couple has style for miles! Chris wore a slim fit gray tux from J. Crew to compliment Sarah's timeless dress from Athena's Bridal. 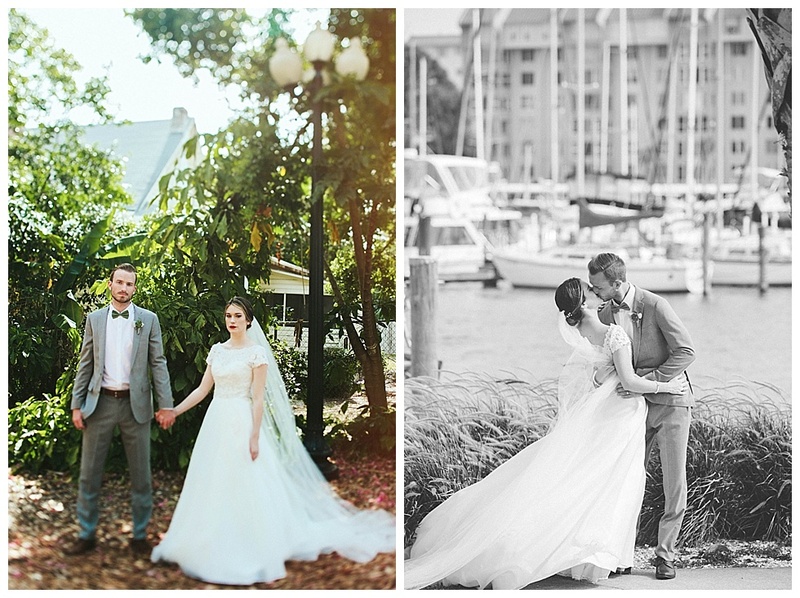 In between the mass and the reception, the wedding party explored downtown Dunedin for photos. We stopped at Rosie's Tavern, a favorite watering hole for Chris and Sarah, as well as the marina and park off of Main street. 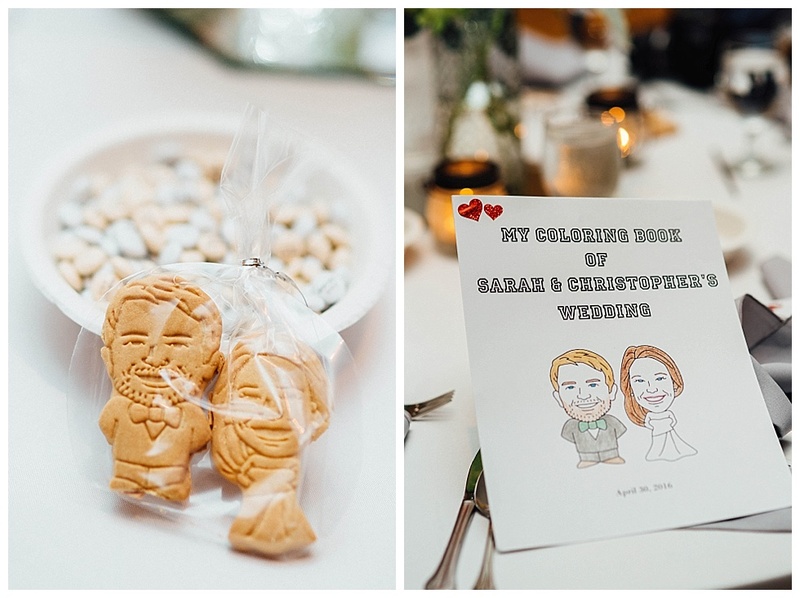 At the reception, Sarah and Chris incorporated a wealth of personal details, including their own wedding coloring book and custom caricature cookies of themselves! 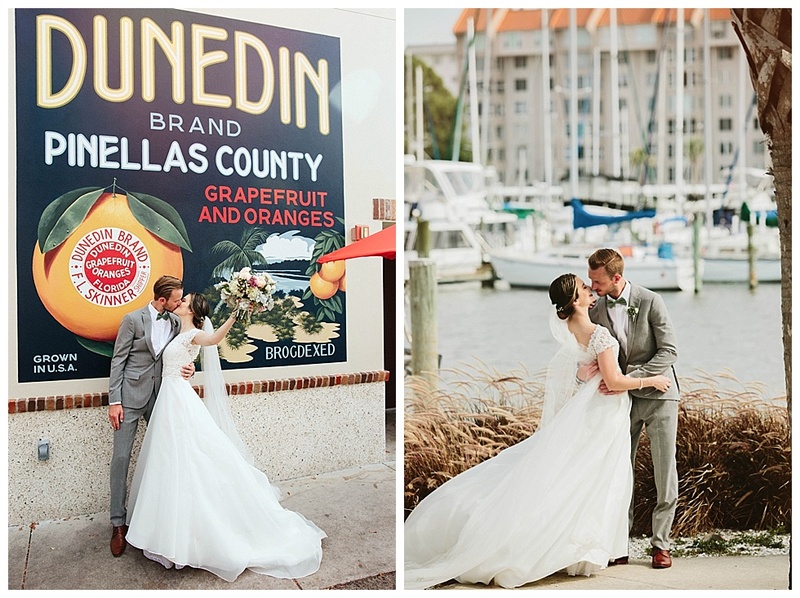 For place cards, they alphabetized guests' names on post cards with some of their favorite destinations, including various towns in Florida, places in Chris' home state of Texas, and Franciscan University, where they met.